This edition adds some new takes on old topics, from non-conformity and tuning up talk to a rended tent and a calm yet madcap man. In my last blog I wrote about “The Never-Never World of Movie Scripts.” It included warnings from gurus and my own advice that screenwriting should be left to experts—those possessing specialized training, great experience, and insider knowledge. People lacking these qualifications, I wrote, should attempt a movie script only at their own risk. Having provided more than convincing arguments against joining the never-never world of screenwriting, I—lacking training, experience and insider knowledge—immediately returned to the development of a screenplay of my novel, Illusions of Magic. The explanation for this involves aspects of creativity that have caused scientists a lot of sweat. In an article entitled “The Messy Minds of Creative People,” however, Scott Barry Kaufman explains scientists’ emerging work bringing order to the disorder of creativity. The messiness, Kaufman writes, is a measure of traits and behaviors that conflict with each other, such as openness, non-conformity, high energy, impulsivity, precision, persistence and low conscientiousness. In his interesting overview, Kaufman also writes of the two cooperative stages during the creative process, Generation and Selection. Generation consists of idea production and originality, while Selection involves criticism, evaluation, formalization and elaboration leading to a coherent final product or mission. During the Generation stage, he explains, it is crucial to silence the inner critic—allowing for many diverse possibilities to enter the arena of thought. I think this goes some way towards explaining why I have disregarded my own advice and embarked, with partner Anya, on the development of a screenplay which, at this time, is in its second draft. Both of us acknowledge an exceedingly low probability for the production of a movie of Illusions of Magic. So there’s little doubt the effort challenges conventional beliefs and conveyed knowledge. Still, we persist. My January 6th article in The Lakefront Historian, a blog of Loyola University Chicago, deals with the issue of how historical fact enters historical novels. As I say there, historical fiction can round out the details of history while helping us understand history’s wider ramifications. Yet it’s no secret that academic historians often criticize novelist’s rendering of historical effects. 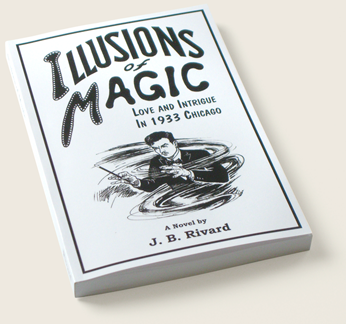 In structuring my novel Illusions of Magic, I wished to avoid falsifying the very real and difficult problems faced by the leaders and citizens of Chicago during the three weeks that included the nineteen days between Mayor Anton Cermak’s wounding and his death March 6, 1933. Thus I chose to confine my fiction to imaginary Chicago residents like magician Nick Zetner and precinct captain Liver Jack Horn. At the same time, I strove to imbue these characters’ discourse with sounds of the thirties. Not simply in the choice of word or slang, but with what Schama calls “the tonal music” of that most difficult period in our history. “It’s the highest poetic honor,” says Nick. Talking about Mayor Cermak’s fateful trip south, Liver Jack says, “He was down there in Miami, meeting with the butter and eggs man—the President…” ‘Butter and eggs’ informs us of the mayor’s purpose—seeking federal monies for his struggling city. I had help casting these dialogues. My parents, as well as other relatives, lived near Chicago and were adult during the thirties. They spoke the lingo every day. Later, it was easy to recall father holding forth on Dillinger or Farley, or my mom speak of Hooverville or hobos, in the vernacular of the day. It is remembrances of those voices that aided my writing of this historical novel of 1933. The writer, journalist, editor, actor, and more, helped found the literary journal, The Paris Review. He was its editor, as well. But George’s life was really a kaleidoscope of unusual approaches. What is not said above, but the mourners knew, was that Jimmy Grucci had perished in the explosion of his own huge fireworks factory. The blast sent neighbors scurrying after children and fleeing in panic for their lives. It blew out windows and collapsed roofs of surrounding homes, overturned cars, cracked walls and chimneys, and knocked out power to 7,000 homes near the town of Bellport, NY. George Plimpton was probably most famous for his book Paper Lion: Confessions of a Last String Quarterback. It reported how he tried out and briefly played for the professional Detroit Lions football team. George Plimpton was a charming master of ceremonies, a weaver of fantasies, a witty and prank-loving man. He wanted to be seen as never working up a sweat—never striving. Always he seemed to be saying, “Remain calm, remain calm and carry on.” He died in 2003. When it was recently announced that Ringling Brothers Barnum & Bailey Circus would cease operation, I felt a twinge of nostalgia. After all, was this not the demise of an American Institution? In 1870, Phineas T. Barnum’s circus opened under a small moth-eaten, patched-together tent. Admission was one cent. A couple of years later, Barnum coined the phrase, “The Greatest Show on Earth,” and admission now went to a nickel. Barnum, master showman, began by exhibiting Tom Thumb (a dwarf) and the Fiji Mermaid. Called “curiosities,” these exhibits included the original Siamese Twins, Chang and Eng, who were joined at the chest. A tent show with acrobats, animal acts, clowns and performing elephants was also featured. Not everything was quite as it seemed. The Fiji Mermaid, supposedly caught off the island of Fiji, was featured in side shows. It was constructed from the top half of a juvenile monkey stitched to the bottom half of a fish. For years, the Siamese Twins, exhibited as freaks, attracted the curious. Born in Thailand, they adopted a surname of Bunker in the U.S., married separate wives and had children. As they aged, they were forced to consider the possibility of surgical separation. It was not to be, however. Chang died Jan. 17, 1874, followed just three hours later by Eng, age 63. Following World War II, movies and television cut into the appeal of many of the acts. Smaller crowds caused the “Big Top” to be abandoned in 1956. Later, the circus was attacked by animal-rights activists, who alleged the animals were being mistreated. Not too long ago the circus stopped exhibiting its elephants altogether. After 146 years, an epoch of sensations had run its course—neither curiosity, investment nor nostalgia could save it.